In Russia-occupied Sevastopol, activist Aleksei Ivanov, a supporter of the Russian opposition politician Aleksei Navalny, went to one-person picket on the embankment, joining the Russian action "He Is Not Our Tzar!" During the protest, Ivanov changed his posters. One of them said: "Another six years of theft and lawlessness? Thanks, no. 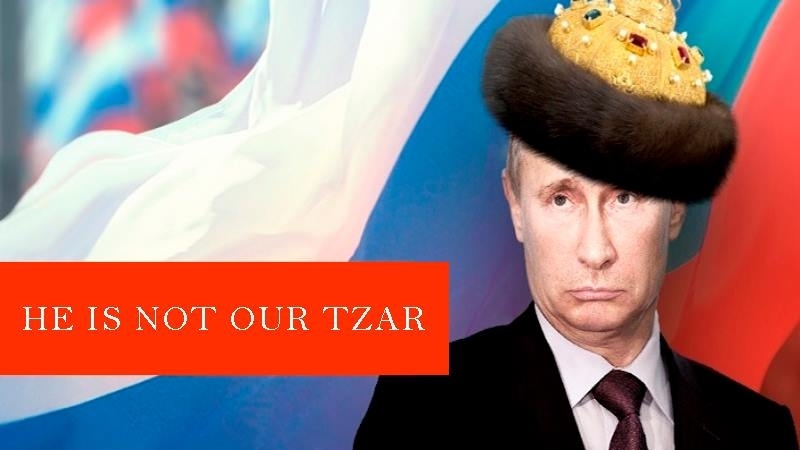 He is not our Tzar! ". On the second, the activist demanded the release of Igor Movenko, who was sentenced to 2 years in a colony-settlement on charges of "extremism" by the Gagarin district court of Sevastopol on the eve. Earlier in the center of Moscow, on Pushkin Square, the leader of the Russian opposition Aleksei Navalny was detained. May 5 supporters of Navalny launched protests in Russian cities under the title "He Is Not Our Tzar!" According to the reports by Russian media, the protests were held in Vladivostok, Yuzhno-Sakhalinsk, Khabarovsk, Tomsk, Barnaul, Irkutsk, Chelyabinsk. The protests were timed to the inauguration of Vladimir Putin as president of the Russian Federation, to be held on May 7. Reference: Igor Movenko was accused of a crime under art. 280 part 2 of the Criminal Code of the Russian Federation (public calls for extremist activities) for a comment he left in the group Crimea-Ukraine on the social network VKontakte. According to the investigation, the commentary of Movenko is hostile to Russia and to the participants of the so-called "Russian spring". Movenko in turn believes that this case is a consequence of the events that happened to him in September 2016, when he was beaten in Sevastopol because of the symbols of the Azov battalion on his bicycle. Igor Mavenko was then diagnosed with open traumatic brain injury, brain concussion, fracture of the base of the skull, fracture of the jaw, closed fracture of the nose bones, eyeball contusion and other injuries. On March 21, the Gagarin district "court" of the city of Sevastopol did not hold the scheduled debate of the parties in the criminal case against the Ukrainian activist. At the beginning of the trial, Movenko’s lawyer Oksana Zheleznyak filed a petition to attach to the case materials an opinion of an independent linguistic examination, but the petition was rejected and the meeting was postponed.